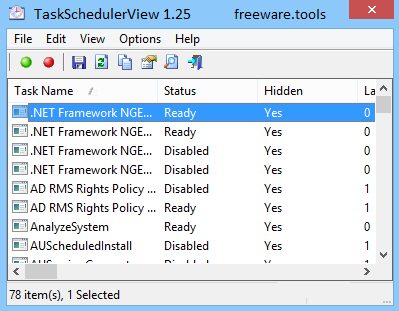 TaskSchedulerView makes retrieving system details easy by displaying a list of all tasks from the Windows Task Scheduler in one easy to read table. TaskSchedulerView also gives you control over the disabling/enabling of multiple tasks at once. TaskSchedulerView will also list those tasks conveniently by name, description, status, whether or not it is hidden, last/next run times, the number of missed runs and much more. This tool works on any version of Windows, starting from Windows Vista and up to Windows 10. Both 32-bit and 64-bit systems are supported. Windows XP and older systems are not supported. Scheduling tasks is one of the most important and overlooked tasks that Windows can perform. Some programs will not function without it, and a startup cluttered with multiple applications can severely slow down the computer. TaskSchedulerView addresses this and all other issues related to scheduled tasks by allowing users to view and disable tools that have startup entries. The lightweight program is very intuitive and new users will find it very easy to operate. Once started, the application automatically dumps all the startup information found into an ample list. Columns with different headers store data and each utility is assigned a unique row. For increased accessibility, users can activate a grid, as well as a 'mark even/odd' rows option. Among the information displayed in the main window, one can find the titles of the scheduled applications, the executables involved in the process, as well as short descriptions (if available), and their 'hidden' status. Also, the program can scan the local computer, as well as a remote target, provided a valid computer name is defined. Thus, the tool can detect hidden programs and, for improved results, users are recommended to run the tool with Administrator credentials. A great feature is the ability to disable or enable scheduled tasks from the main window, performed by simply selecting the items and clicking on the toolbar buttons. Once results are satisfactory, one can generate log files for single or multiple entries, which bear the TXT, CSV or XML format. HTML reports can also be created, either with the entire list or just from selected items.